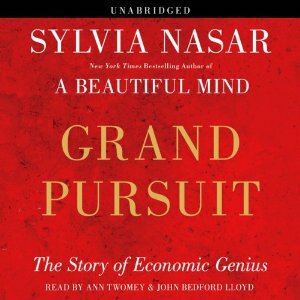 Sylvia Nasar’s most recent foray into the marvels of humankind, Grand Pursuit, is an ambitious look at the science of economics. Rather than a neatly-constructed timeline with milestones clearly indicated, this is a convoluted, back and forth expose’ of the real people behind the rise and fall of the world economy from the early 1800s to present day. The book should have included a preface that states: Warning –– a reader whose education lacks Econ 101 will be easily, if not greatly, confused. The review copy read for this review is an Advance Reader’s Copy. There are no graphics, photos or embellishments to illustrate the text. Clearly, Ms. Nasar’s intent is not to deliver a rather lengthy lecture series on the evolution of the science of economics (how business and money and people interact). Instead, she weaves a detailed account of the persons who make up the pantheon of stars in her chosen field of study (e.g., Maynard Keynes and Paul Samuelson). The ups and downs of their lives might be fascinating if the reader possesses a basic knowledge of who they are/were and their contributions. It’s quite boring to read about someone whose genius is not made clear in Nasar’s text. The theories of these individuals were alluded to, but not clearly defined; and the case to be made for their status as genius is lacking. The lives of the economists featured were intertwined due in no small part to the challenges placed before them – several great economic depressions and two world wars. Their need to satisfy personal goals, both intellectual and romantic, fueled their unrelenting efforts to create an ever-lasting formula for a stable world economy. Alas, the effort continues to this very day. While it is helpful and enlightening to step out of one’s area of expertise, doing so can be less than enjoyable. As much as this book missed the mark, The Age of Comfort by Joan Dejean was an unqualified hit. (A brief review is posted below.) Both books require a background in the underlying topic and a genuine appreciation of the effort required by the public at large to grasp the evolution of a critical concept. Ms. Nasar’s writing style seems to mimic the period that she is discussing. The sentence structure in many of the early chapters is ornate and required re-reading in order for this reader to grasp the meaning. As she brings the reader into the 20th century, the wording becomes relaxed and takes on a familiar cadence. Perhaps some editing took place before the final version went to press – one can only hope! Had this treatise been severly editied, it would have the makings of an engaging inflight magazine article. As it is, it is much ado about nothing. 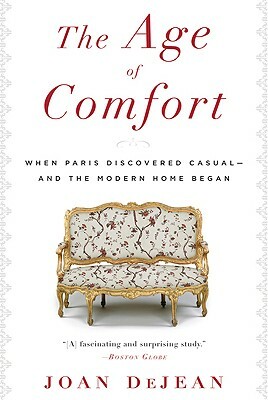 The setting for this book is Paris in the late 17th and early 18th centuries where the notion of comfort in daily living became all the rage among the ruling aristocracy and the wealthy upper class. Today, we take standards of comfort for granted such as flush toilets, running hot and cold water, showers, private bedrooms and cotton clothing items that gently envelop the body. Back then the ideal was reflective of the age of magnificence embodied by layers of stiff clothing, standing around or perching on a straight chair. Thanks to some clever and unrelenting ladies and gentlemen in the courts of Kings Louis XIV and XV, there was rapid change that took only one century to take hold. Along with the royal shift came the first foray into investing in “the market” which produced a boom with vast monetary rewards for a new non-royal upper class. Author Joan Dejean is a well-respected authority on France and all this is uniquely French. She delivers the equivalent of a university-level course in this well-written and nicely-illustrated book that is worthy of a place in the library of a designer or student of design. Tagged as 17th Century, 18th Century, 20th Century, audiobook, author of A Beautiful Mind, Bloomsbury USA, book reviews, comfort, confusing account, convoluted writing style, cotton clothing, critical concepts, design, designers, early 1800s, Econ 101, economic efficiency, economics, Europe, flush toilets, France, genius, Grand Pursuit, hot/cold running water, individual liberty, intellectual tools, interior design, Joan Dejean, Joseph's Reviews, Kindle Edition, King Louis XIV, King Louis XV, Maynard Keynes, nonfiction, Nook Book, ornate sentence structure, Paul Samuelson, political problems, poorly edited, recommended book, royalty, Ruta Arellano, Simon & Schuster, social justice, survey books, Sylvia Nasar, The Age of Comfort, the market, the modern home, the science of economics, The Story of Economic Genius, unabridged audiobook, When Paris Discovered Casual, Where Have All the Flowers Gone? Antonia Fraser is known in England as Lady Antonia Fraser, her father having been an Earl. Her forthcoming book Must You Go? – My Life with Harold Pinter will be released in the U.S. on November 2, 2010 by Nan A. Talese/ Doubleday. 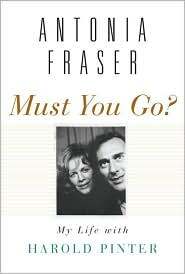 Fraser’s memoir centers on her 33-year love affair with, and marriage to, the celebrated playwright and poet Harold Pinter. We’ll have a review up by the release date of Must You Go? but, in the interim, it’s worth noting that this memoir is getting fantastic write-ups on the other side of the pond. Here’s a small sampling. Interested? Lady Antonia Fraser will appear at the Los Angeles Public Library (630 W. 5th Street) at 7:00 p.m. on November 8, 2010; and at the San Francisco City Arts & Lectures Herbst Theatre (401 Van Ness Avenue) on November 9, 2010 at 8:00 p.m.